This is an extremely long post. 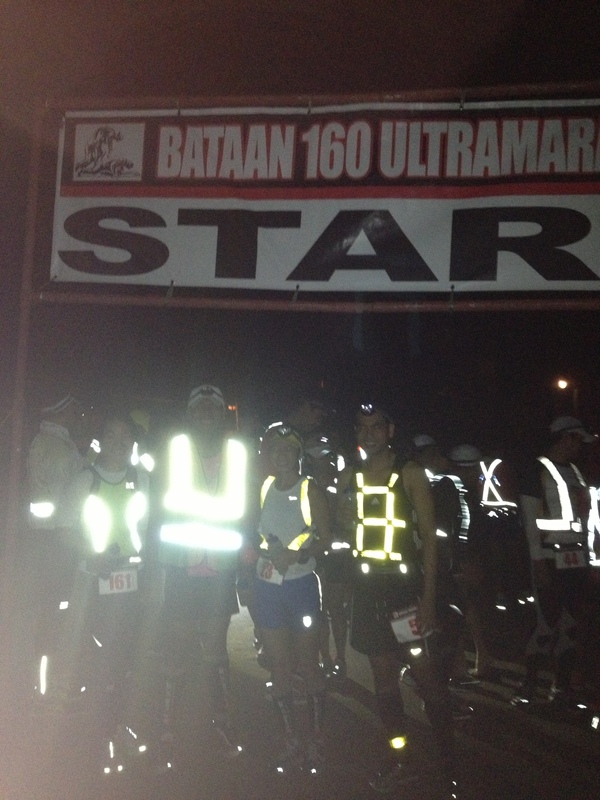 I ran the Bataan Death March 160K Ultramarathon in 29 hours so do the math and get your popcorn ready if you really want to read and finish. Most of it might not make sense. Promise, I have something nicer which will be published in a magazine that helped me to start running in 2009. These are twitter-like thoughts. Some of it might have twit-pic. Some won’t have photos especially the peeing part ( Google Paula Radcliffe’s video and get an idea). You won’t need parental guidance here – just patience – feel free to close your browser. Me and my fake non-jittery smile at Kilometer Zero. 1 6 minutes per kilometer is way too fast. I should slow down and save this for the 160th kilometer (It happened!). 3 This 7K uphill at the start is crazy. Nothing’s crazier than joining this though. 5 Ang lamig (It’s too cold) cough, cough, cough…The skyline of Mariveles is breathtaking though. 6 Ang hirap (I’s so hard!) What if I just fell off the ravine. That would be the earliest and most stupid DNF in the history of BDM. 7 I can hear vehicles honking. I hope they have my EFS Endurance ready. 9 Damn! Uphill ulit. Wala bang madaling ultra? 12 Why am I running alone? Where’s the rest? 13 Where’s that 14k turn? I hope I’m not lost. A group of about 50 factory workers in yellow were occupying the streets. They were nice to give way as I pass in their midst, some of them cheering and taking pics of me in their camera phone. I felt like a rockstar! 15 I need to pee…ugh, but there are runners about 200 meters behind me. 16 I really need to pee. There are three abandoned jeepneys parked. You know the drill- Paula Radcliffe, thanks for the idea! 17 Back to Roman Highway. 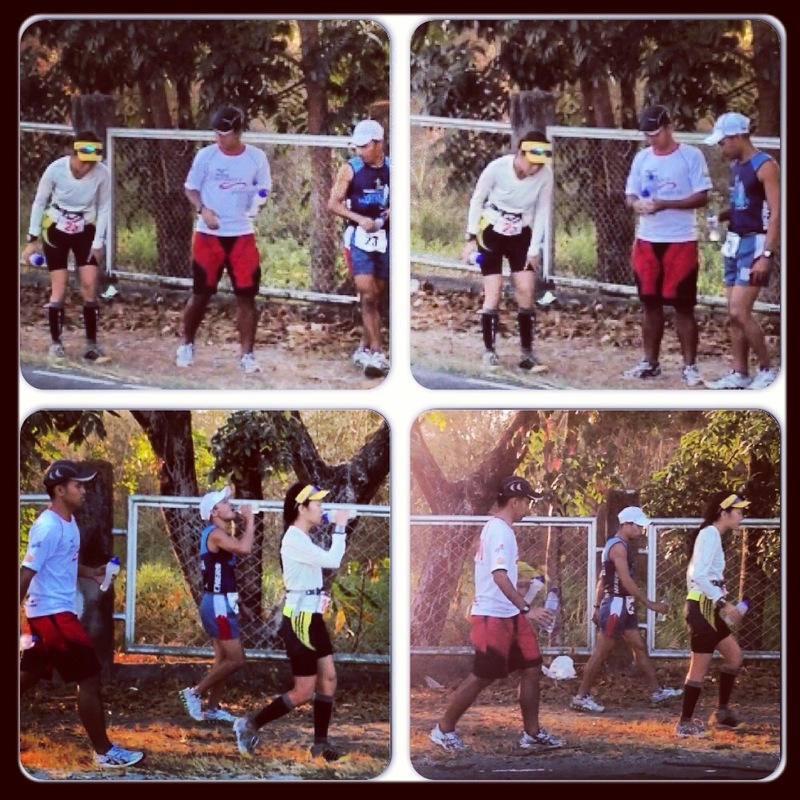 I was running with Pastor Ferdie. Damn uphill. I need to conserve so I took walk breaks going up. 19 I told my crew to text Tere that I’m okay and pray that my allergies go away. I don’t think they texted but I guess they prayed cause the Claritin and Berocca I took is starting to work. 20 Rolling hills again. The sun is out and it’s a very nice morning sun. 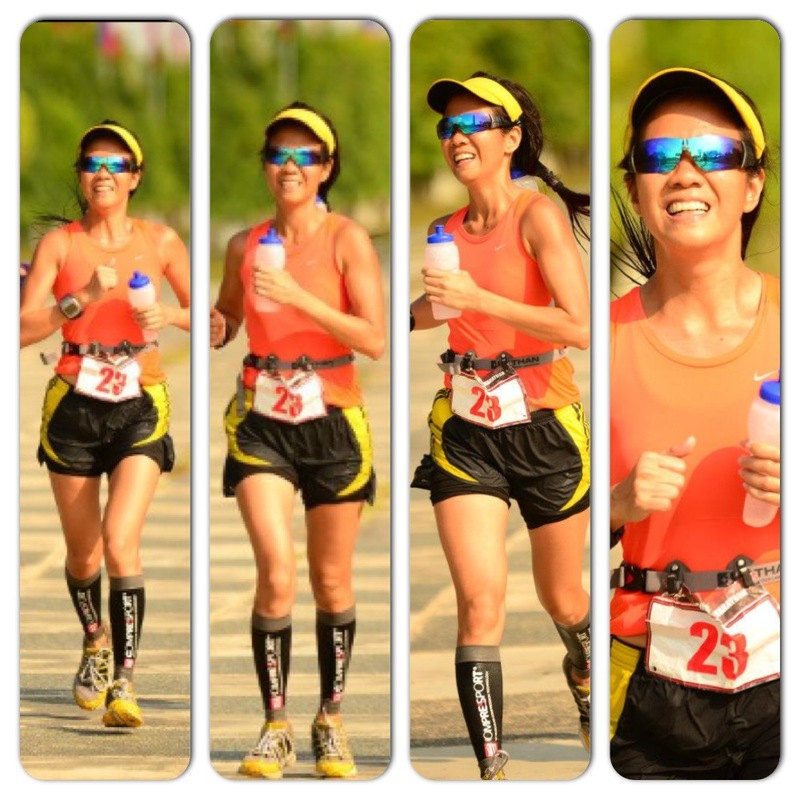 It’s awesome to see the sun shine and know that you are blessed to have the body and mind ready to run 140K more. 21 I was running solo. 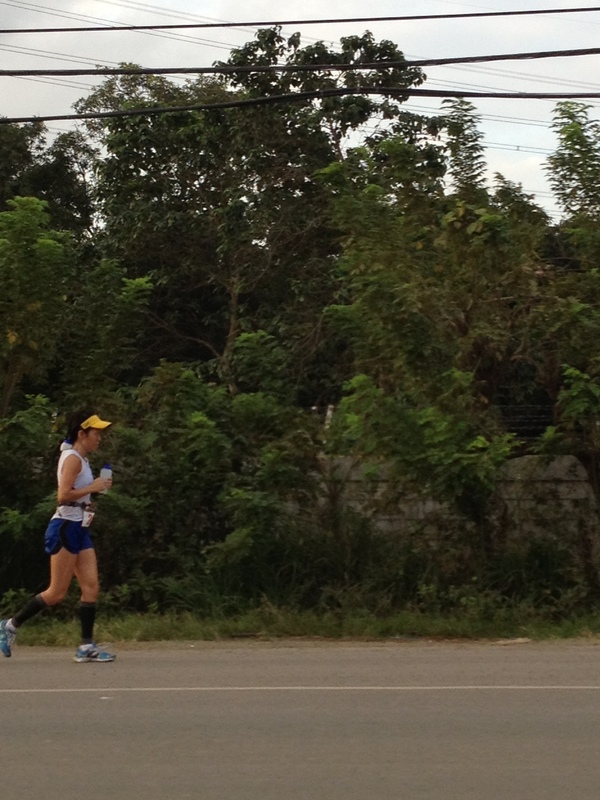 As if the short chat and running side by side with Ptr Ferdie was the exortation I needed, I started my morning worship. 22 Okay, Lord, where’s the next turn to the National Road. I am alone again. I hope I didn’t miss it. 23 There it is- Gas station, we should turn right. Ugh. Not yet. 24 Finally, it’s the right turn to the National Road. It’s a rolling terrain again but I know there are more downhills. 28 The sun is out and it’s hot! Playtime baby. We’re in the National Highway again. 29 Like a kid, I started to gain speed. I was thinking it’s half marathon to go and I can eat lunch and change to my pink ensemble – my Kwicky blade light, pink k-swiss shorts and white tops. 30 Last two kilometers and we are out of this highway. Where is that damn entry to Orion??? 31 I should pee again. 32 Oh, thanks there’s my support? Ugh, wrong car. Can I have water? 33 The town looks different in the morning. Why are there so many tricycles occupying this sidewalk. Actually, there’s no sidewalk in most of the town’s national road. 34 My Garmin seems to be off by 2K than the kilometer markers. I am sure though I am not lost. 35 Flashback to BDM 2011, a group of drunken guys tried running with me here. They were not heckling or touching anyway so I just outran them. 36 Somewhere in Pilar, I think. My driver is lining up at a lotto shop. There’s a bridge under construction so we need to take a reroute. I told my crew to find a place in a kilometer or so as I need to pee. I can’t do the same drill in broad daylight in this busy town. 37 Where’s my PEE stop? This might do: 1) a tall wall; 2) an opened factory gate with main building still far from the gate; and 3) no one around. 38 My crew was directing me to pee at Shell. No, thanks! That’s way too flashy. 39 3 Kilometers and I’m done with the Marathon. Each stride felt like I’m near the finish. 40 I doused myself with water and kept running – singing Jeremy Camp songs in my head. Last thing I want to happen is to rain hard so I saved everyone from my loud singing. 41 Tere and two other Red Cross Volunteers arrived in Vero’s car (Thanks Vero!. I got pumped up. She asked me to pose for a photo. I just said, “Do you have my adobo? That’s 42K marker after the bridge then last 8k to 50. Prep everything.” I really feel like Senyorita with lots of Facundos. Thank you guys, really! 42 This is probably the most stoked moment of the whole run next to the finish line. 43 I ran the bridge and saw the 43K BDM Marker. Shocks! I missed the 42K marker. It’s the same distance as my Garmin so I’m on track. Last 7K and I can eat! Flashback to BDM 2011, I asked Mark and Rhea, my support crew then to take my picture here. That’s my only photo with a BDM post (other than 0 and 102). 44 I caught up with most runners, telling them. Yey, last 5K. Sounded weird, I know. 46 I should continue to run and rest after 4K. 48 Told my crew to prepare the bag labeled 50K for my outfit change plus a plastic with ice so I can soak my feet in it. 49 My crew still stopped at that point. I shouted, go! I got this. I think my driver is paranoid of leaving because there might be extra kilometers just like West Coast. 50 I was ecstatic at that point. 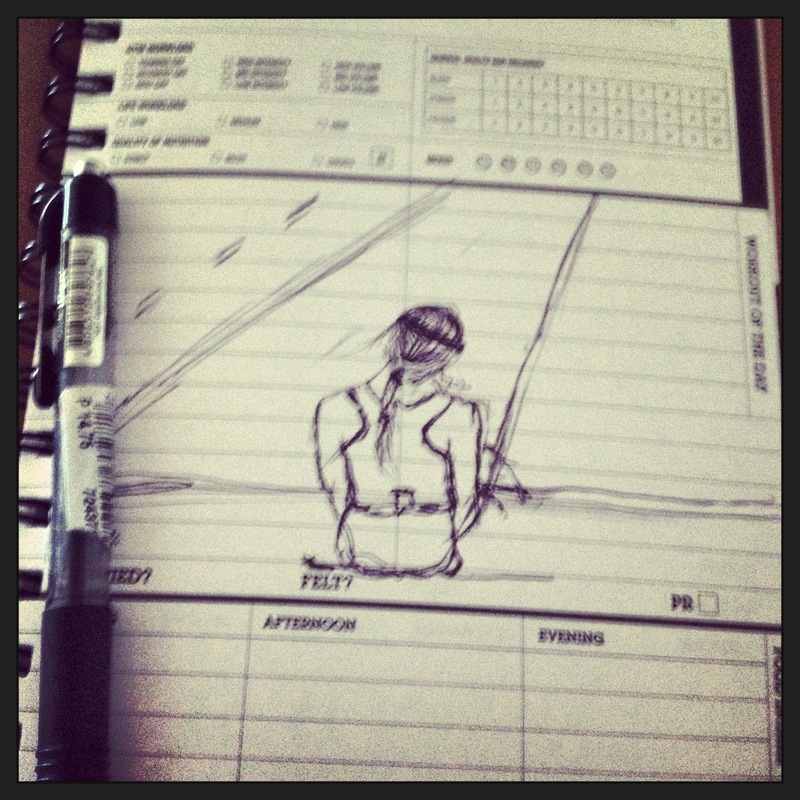 I took off my singlet and roam around looking for the time check while my crew chases me telling me it’s been covered. Back to business, I transitioned to my pink outfit. It was a quick change of my running shoes and shorts. I opted not to change my sports bra so it didn’t really match the whole ensemble with fresh dri-max socks and my K-swiss Kwicky Blade Light. Tere doesn’t know how to fix my hair. I forgot she has two boys! I was doing all this while eating my chicken adobo and rice. It was a bad idea, first time I learned how petroleum jelly taste like. It was time for Kuya Tony, Yan and Brian to rest. Tere, Charlie and Alex will take over. I told them to follow the instruction on hydration and nutrition by the hour. I’ll stop monitoring and will rely on them. Fixing my hair on my own. The only thing lacking from my all male+tere support crew. They’re the best! 51 It will be me and two Simple Hydration Bottle at this time. It is around 12 noon and the heat of the sun is punishing. 52 Get ice. Pour on the nape, on the legs, on the head, repeat. I managed to keep at pace despite the heat. Ugh, I need toothpick. What’s good about being OC is I have everything labeled and numbered. My crew can’t find it, all I need to say is Bag No. 5 in the Clear Green Bag. 53 There’s fire. Seriously, the field was burning for about 50 meters. Did BR turn this into a Spartan Race? It was actually on the leftmost side of the road but I can feel the heat as I pass. 54 Next goal is to see get to the junction of Roman Highway. Oh, there. How do I cross????? Last time I passed this road, it wasn’t that busy. Doc Toto came to the rescue. He stopped the vehicle as I cross the street. Angels are indeed sent to protect and guide us. 55 Get ice. Pour on the nape, on the legs, on the head, repeat. I managed to keep at pace despite the heat. I just try to think of something nice! 57 Time to replenish electrolytes. I said, what it’s been that long? Time to take power gels. What, was I that slow? 59 Seriously, where is that Landmark statue in Bataan. That’s a sign we’re almost in Pampanga. 60 There!!! I was pacing with another runner and i told him It looks different. Nice, modern but I think it has lost its antique vibe. Too white – my nonsense thoughts while running away from it to get to move further. 61 Is it 70K yet? I was zoned out. 63 Seriously, Tere? I don’t need to take EFS yet. Okay, I trust that you are monitoring. 64 I grabbed the adobo that Tere was munching that time. She said it’s not chewy. I thought it was fine. 65 Seriously, I wanna reach 70K. I want to eat merienda. 66 Dinalupihan exit already at this point. The street wasn’t that busy so I crossed it like a pro. 67 3K and I can eat sandwich. Ate some apple and banana. Banana for electrolytes. Apple, other than for its nutrient contents will freshen up your breath. 68 I need to change my Garmin. I wore the second Garmin and said I’ll turn it off at the 10th hour. 69 I’m almost at 70th kilometer. Cool! Almost halfway. I started praying in thanksgiving. I knew I won’t quit. 70 I need to change my Garmin. Ugh, it’s not 10 hours yet. 71 I keep on running and made sure I turn on Start button on the second Garmin exactly at the 10th hour. Oh my! I thought that was running fast. It took me almost 1 and a half per 10 kilometers. Not a race, I’m still on target. 73 If this is a marathon, this should have been the dreaded wall. I didn’t experience any wall though (for my second marathon). I keep moving and praising the Lord. 75 I said this in my blog about BDM in 2011 – “Speedy buses, tricycle drivers, road construction, fumes from the buses and trucks, dust from the dried lahar, lack of shade or none at all, road construction – Name it, they’ve got it. The heat of the sun was punishing. My ice pack wouldn’t even reach a kilometer and it has melted.” It was five times worse this time! 76 I tried to maintain legs freshness by asking my crew to spray liniment or spread salonpas ointment in between my legs and the Compressports I’m wearing on my calves. 77 Salt stick was a big help. I profusely sweat and the heat was unbearable at this time. 78 The gravel on the sidewalk for most part of this road was cemented. I thought it didn’t really serve a purpose because it’s a national highway. 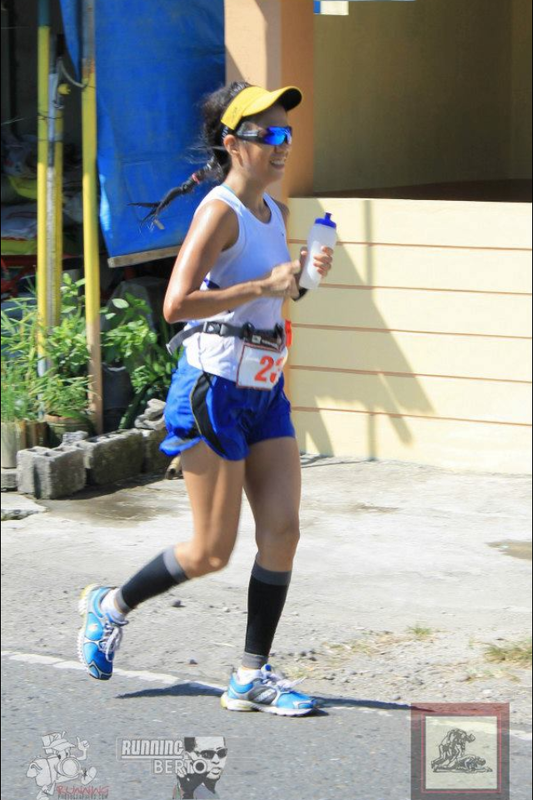 And for us runners, at this point, you would want to take a break from the cemented road. 79 Bridge construction somewhere in this area. Seriously, I’ve witnessed and ran BDMs (except the first year) and the bridges are always under construction. I wonder if there’s an expiration or what. 80 Oh, there’s overcast and then it’s gone. The weather is a joke at this time. 83 The long bridge, the wide highway, the intersecting street. I need to cross the Gapan Highway again! No help this time but I made it in one piece. 84 Team Boring and my support crew were here. It was another time check. I am the 16th runner to pass. 18K to go! 85 We are to take the road to the left, right? Ugh, why am I alone here? I hope I took the right road. 86 A group of teenagers in basketball jersey was approaching and they’re not giving way for me. I ran past them and the last kiddo accidentally or intentionally bumped me shoulder to shoulder almost getting the chance to take advantage to touch. Hello Kiddos! I swear I can tie you on my shoes and drag you for another 80K. 87 It was a bit uneventful from here. I lost track of what I’ve been eating and my crew are religiously taking note of the intervals. 88 Damn! Where is that left turn? 89 Three more kilometers and it’s the last 10K. I reminded my crew to prepare my night gears. 90 Turn left, Say hi to Juscel Laya, and turn right. Wow, Razons! Do you know that they have halo-halo smoothie in this branch? 91 I saw Charlie and Camilla pass me. They’ve been BDM 160K support every year. Perhaps when they run it, they’ll have an army of runner crew. They asked me if I need anything. I said thanks and said Bobby is just near. 93 Good news: They gave me a backup headlight and an alternative reflector. Bad News: It is not enough for the pitch dark portion of the road and they cannot find my red blinker. 96 Losing the momentum, it was the first time the demons attacked. I have covered 60percent of the route. I still have 14 hours left to cover the remaining 40%. It is still within target, in fact way faster than my conservative target. But my mind won’t stop computing. I remembered what Mark Hernandez told me. They entered 102 in 16 hours. I was about 15 hours into the race then. 97 It was another uphill and a bridge. This combination always meant another milestone – that means I’ve moved one town. In a few minutes, I saw the Welcome San Fernando Arc. 99 And running. Asan na ba? If I ran this as BDM 102K and we started at 10pm, this could have been a PR. Sana matapos ko, then I’ll think of grand slam. 100 The streets are lighted, there is a wider road to run into. 102 Finally, the old railway station! Time to take a break. It was time to eat dinner. I ate my Jollibee chicken joy take-out. I refreshed, changed clothes and shoes. It was chilly already so as planned I wore a Zoot longs-sleeves top. I wore a compression shorts long enough to cover my legs and a shorts on top. 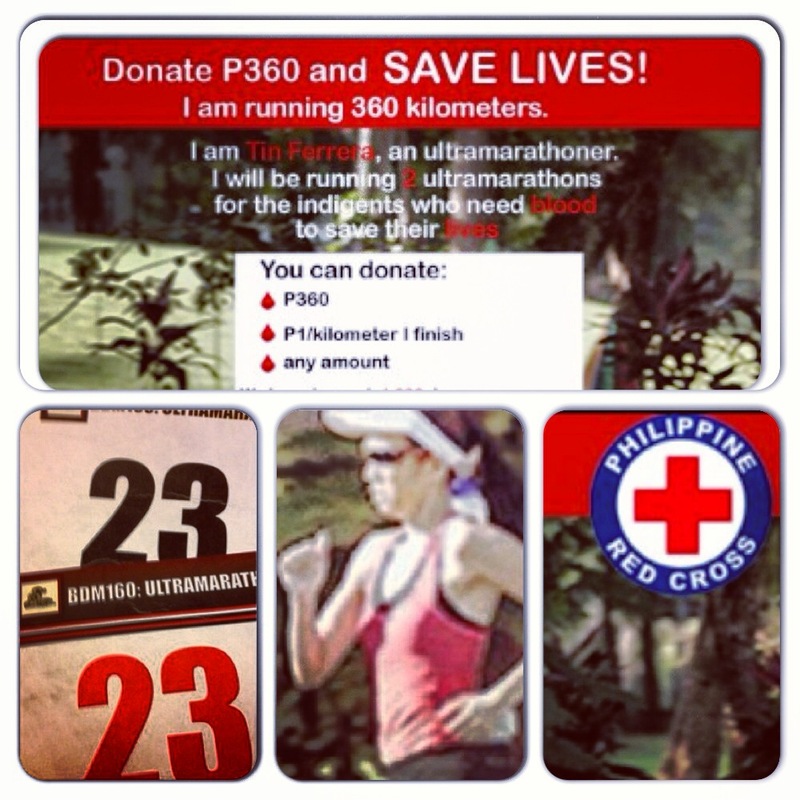 I will be running the last 58 kilometers with Hernan Pineda. He ran a 2:30 marathon in his younger days and can still run a 10K at 37 minutes now that he is 50. 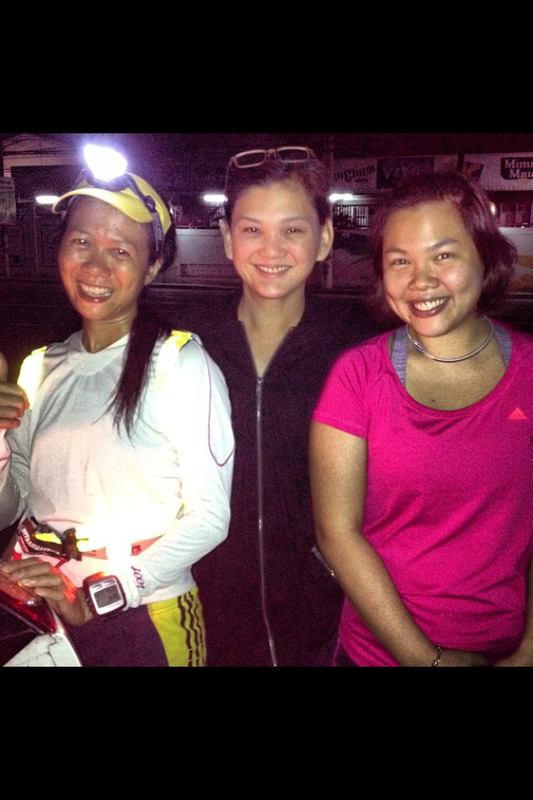 Tere’s tweet as I leave kilometer 102. 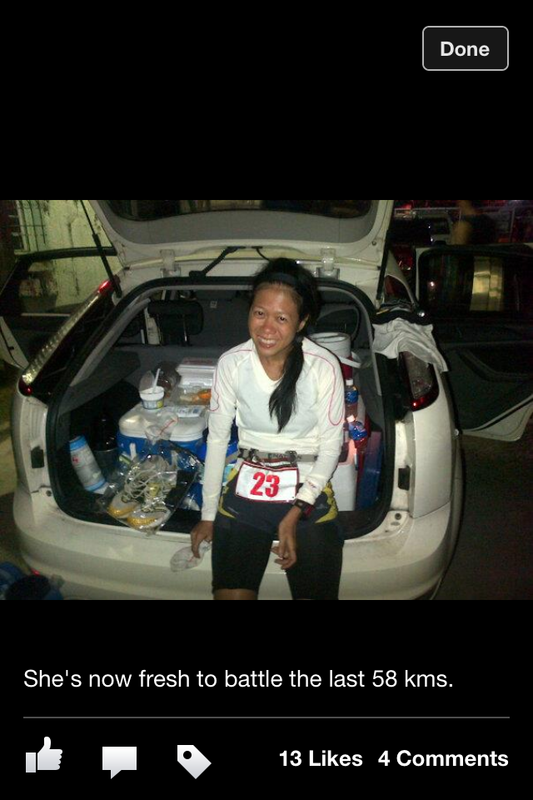 103 As we exit the Kilometer 102 post in San Fernando, Pampanga, I felt the tiredness sapping me. My legs became stiff after a long rest. After a few hundred meters of brisk walking, we started walking slowly. 104 I can feel the discomfort. It was only 8pm but sleep is catching up on me. Probably cause I haven’t had a decent sleep for a week already. I started thinking; those night outs I begged off from could probably help and damn this Lola sleeping habit. 105 We started doing run-walk intervals. I can still run at a good pace but would eventually fade. 106 I saw Tere, Gigay and Eric at this point. Their cheering was good enough to wake me up. It helped. I was taking a break when I started throwing up. I told my crew that I practically threw up my dinner and to find arrozcaldo for me. Tere and Eric are doctors so they asked me questions. I think when I asked them if I stink; they concluded I had no serious problem. 107 I started thinking of reasons to push. I thought, I have pledges based on kilometers I finished. Sayang yun 53 kilometers. 108 We resorted to run-walk intervals. Run 5 minutes, walk 1 min. 109 I was crashing. I stood by a lamp post (with all garbage below it) and took a nap. Tere and Gigay saw me and started chatting with me. 110 50 Kilometers more to go. This is like Tagaytay to Nasugbu. 111 I looked for a more decent place to take a nap. I sat down on the pavement with my back by the wall and slept. 112 I was literally floating in the air. I would run strong then my pacer would grab me because I was running towards the street. 113 They finally got me my arrozcaldo. I was able to ingest it then puke again. I had to let my acidity settle. I ate some more then took a walk to let it digest better. 116 I asked my crew to mix coffee powder with my EFS. It worked for a bit. 117 I threw up again, meaning my body did not take the caffeine. At that time, I knew caffeine would be a No. 118 I resorted to Kopiko candy and lollipop to eliminate the sourness. 119 Mcdonalds is my first decent rest room break. It’s so comfy and cold, I spent minutes sleeping inside. 120 6 more kilometers and I have done three marathons today. 121 The nth time people asked me why I am doing this and what it is for. Next time, I will bring fan sign and just flash the answer. 123 The stretch of Mc Arthur highway is either filled with old/huge trees with roots and trunk occupying the sidewalk or people from all walks of life (drunk, so drunk and not so drunk). 124 The problem with running on a busy street is you can’t just pee when you got to pee. 125 The light from these vehicles are blinding, most of the times enough to wake me up and realize I’m already in the danger zone. Actually, even the farthest left is a danger zone with its uneven surface. Well, I’ve been in danger zone since I decided to join. Thank God for my protection! 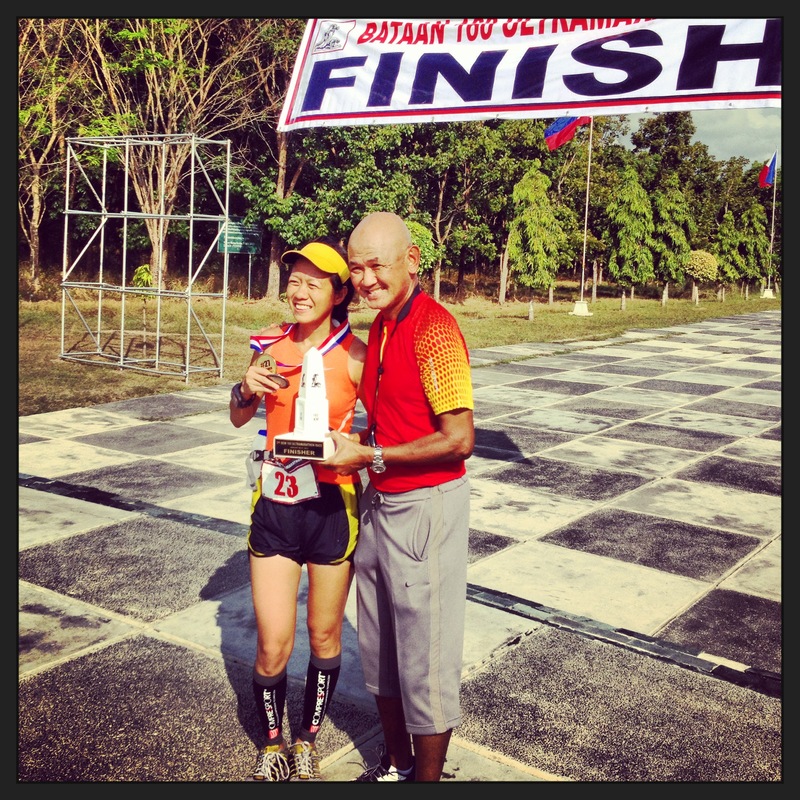 126 585 meters more and I am done with three marathons. 127 Bye, bye Tere, Gigay and Eric! Pose for some pic. I asked them a question which assured them that I am still awake and conscious. Either I’m so tan or they’re so white. Or both..
129 Ang alikabok na naman! 130 The streets are widening. I can see the SCTEX or NLEX from afar or whatever it is. 131 We passed by a short tunnel. I told my pacer that’s lahar, parang beach lang no? I am not to really making sense at this point. 132 About 10 kilometers to go and we will see Mcdonalds. I am trying to run faster at the downhills which wakes me up – take walk breaks – then crash back to sleep in any waiting shed or pavement I’d see. 134 “What’s taking them so long? That should be less than an hour drive. That’s even nearer than Pasig to Baras (my hometown).” Then it dawned on me, the finish line is still as far as Manila to Baras. 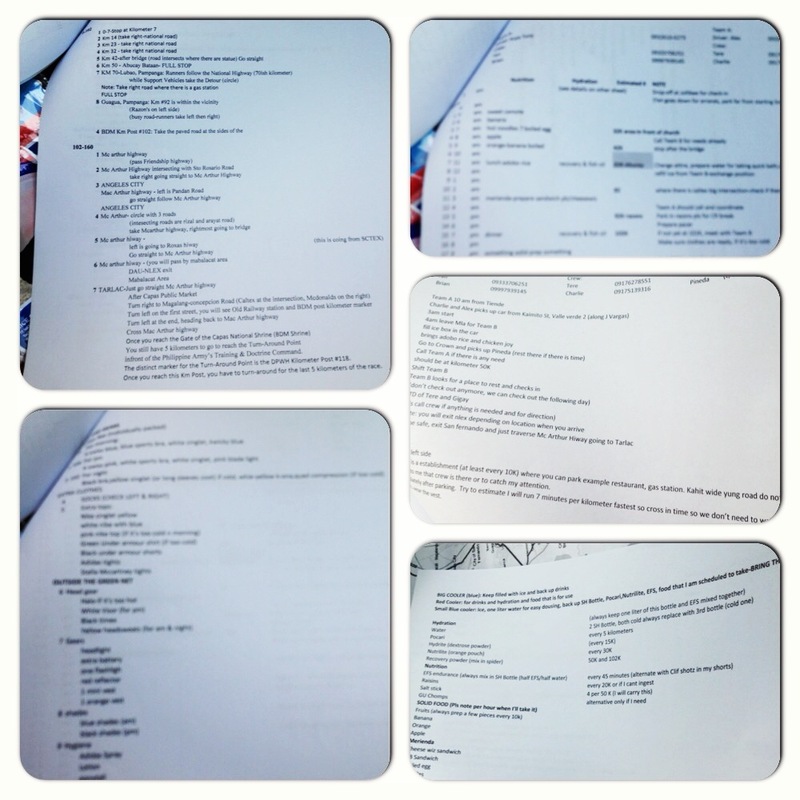 Sometimes I keep myself awake by reviewing Yan of the BDM Manual I made. Sorry for my Taray moments! 135 7K na lang Mcdonalds na, Kuya. We’ll turn right. Then we saw Mish and Wes whom I didn’t recognize until I heard her bubbly voice. I hope they stick with our pace to keep me up. My pacer has only finished about three sentences as of that time. 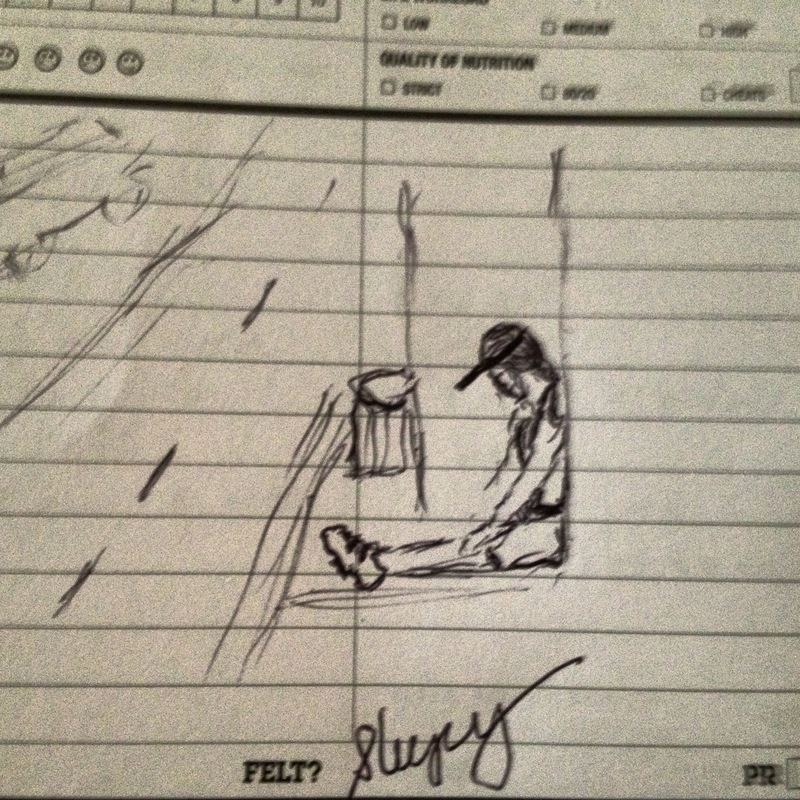 We also saw Irene sleeping while being dragged by her pacer. 136 I told my pacer that we’ll run-walk and won’t stop na until we reach Mcdonalds. So we did a 1minute fast run, 1 minute walk for 10 times then I take shelter again on the next lighted pavement. 137 I was sleeping soundly for 2 minutes when I heard a voice. “Naku, kawawa naman. Pumayat na siguro yan. 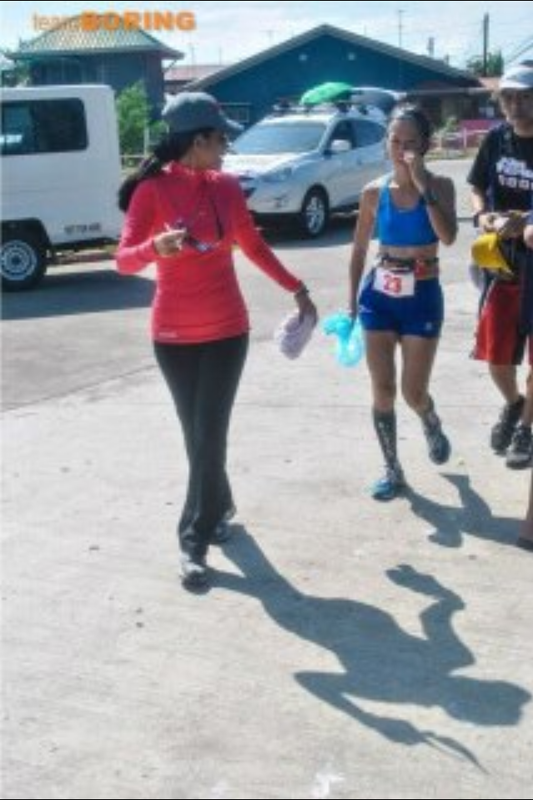 Siguro kasing taba ko yan kanina…hanggang san pa ba kayo….” I told my pacer, let’s go! The bank guard said, “Ingat! Ang layo niyo pa” — I said, Thanks, ang ingay mo kasi (silently). We left immediately before my bitchiness comes out further. 138 That’s the M-sign, let’s cross. NOT! 139 May signage kuya, basahin mo, Capaz na ito! NOT! It’s a canopy of tree, not a signage. 140 That’s the M-sign, let’s cross. NOT! 141 Eto, Mcdo na talaga. 142 Passed by Mcdo and finally saw Team B Crew. Tere asked if I’m okay. “Yup, okay na. I think 19k na lang. Recovered na ko but I need to throw up again….” Pls get me Snickers, clear plastic in the clear box. Bag No.3 – Yep, I am that OC! 143 17K to go. Let’s do this! Brisk walked most of the 2K. I thought I was recovered but all of a sudden I turned to a zombie. 144 Sun was shining up as we climb towards Camp O “Donnel. Vehicles would pass and would honk at us. Not even the sunshine can keep me up…. 146 False downhill. The terrain was rolling with really steep climbs. My eyes would shut down while I run. I’d tell Kuya to walk fast so I can follow his pace while I hold a string on his vest so he’ll feel If I’m falling. He might not be the talkative pacer that I needed but he was quick to hold me when he’d feel me literally getting off balance and falling. One of my sleeping moments. 148 THROW-UP, GARGLE, SPIT – another sequence I’ve learned. 149 I used to wonder how my male friends do it when they spit while running and it doesn’t land on their shoes. Now, I can do exactly the same with ease. Yeah, Gross! Dear BR, Why did you start the route with a steep uphill and end it with another one? Why do we have to run 10 kilometers after seeing this? 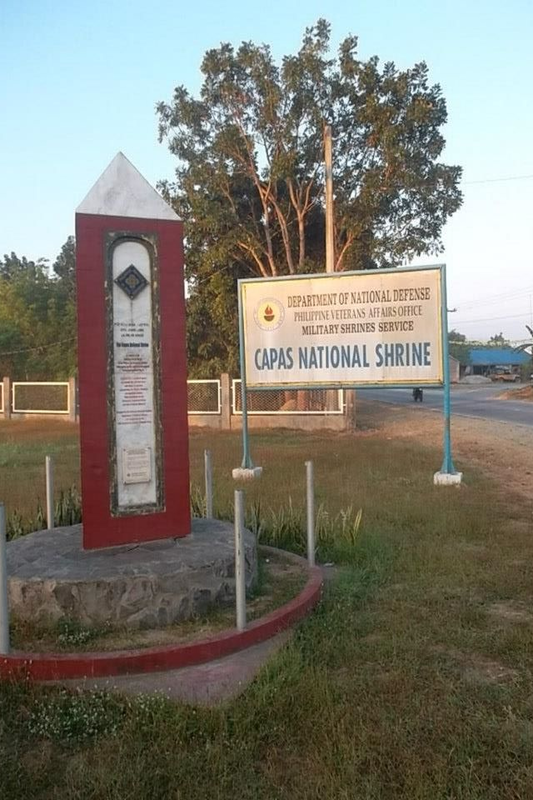 150 Capaz Shrine!!! I saw Tere and my Team B., Rexie and the others, etc., etc.. I hardly acknowledged them. 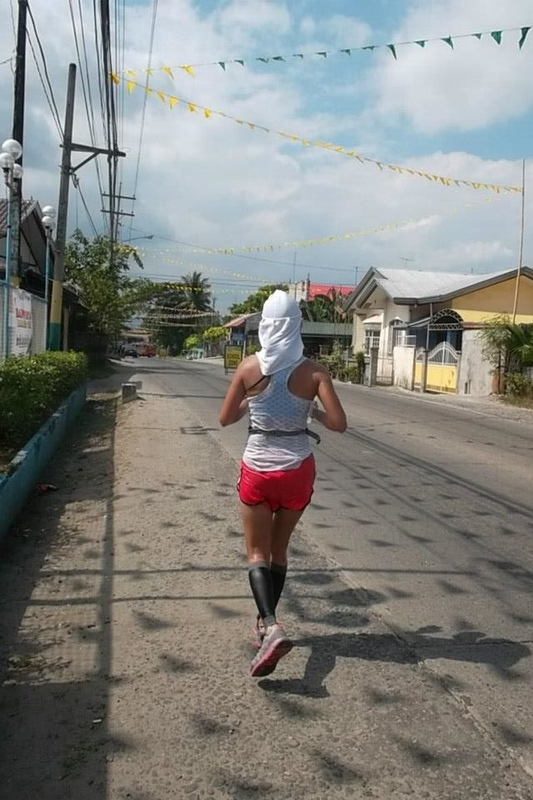 In fact, when they told me I am the second female and I can still do a 27+ if I keep on running, I said, “Kayo kaya” (It was fortunate I’ve lost my voice then or I’ll be branded as the bitchy girl runner.) But really, Sorry guys! Sorry to those who cheered that I didn’t acknowledge or I’ve given my scary look. 151 Wow! Downhill. Kuya, Let’s run this. No, Let’s walk. I am crashing again….My vision blurred at that point. I remembered the sharing of Kuya Kim in Runner’s World that for signs of stroke, make sure you keep yourself awake. 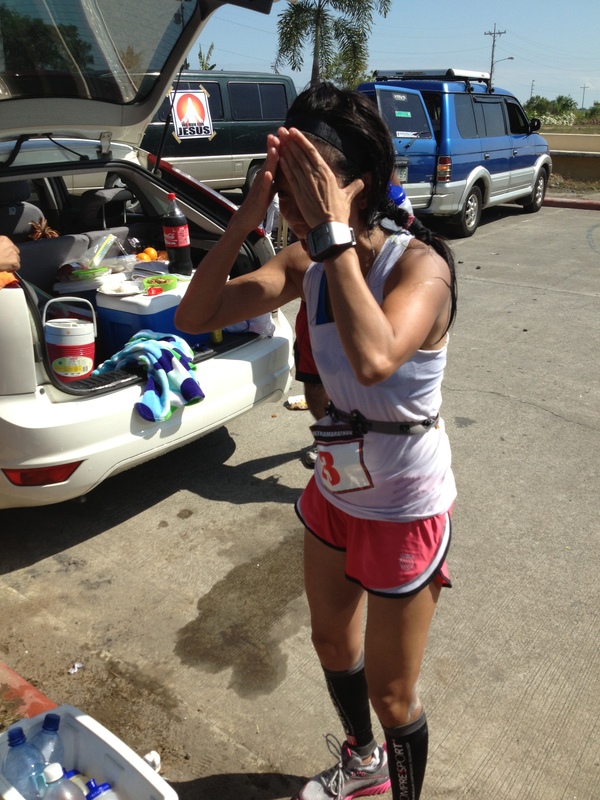 I stopped then started talking, and talking, and talking while Kuya was dousing me with water. In less than a minute, vision cleared. I was looking at the grass around- not a good idea. 152 We walked a few meters, saw a burger machine with my most basic requirement for my sleep break: A wall to lean on, flat pavement to straighten my leg and at least a few meters from the road. After what feels like forever, I stood up and saw Mish and Wes and other runners as we went out. 153 I don’t want to DNF. (Or I’ll be the record-holder of nearest DNF to the finish line). I tried to remember the reason why I have endured 153 kilometers already. TJ. my pace partner at West Coast whom I’ve requested to pace me for portions of 160K didn’t make it. His Mom passed away a week before and I promised I’ll offer this run for his mom and everyone who has suffered and is still suffering from cancer. I remembered my Tita who will be undergoing operation in a few days. I remembered those who suffered on these roads during the war. To those who donated, thank you! Just so busy but I’ll give you an update next week. Those who need ORs, please message me. I was trying to convince my mind and body to keep going while at the same time being careful not to crash again like what happened a few kilometers ago. 155 It was the turn around. Frank, the marshal was in his usual bubbly self. They congratulated me. I can’t remember who else was there because it was only Frank’s voice that I could recall and tall-thin guys in jackets. I’ve found hope! I need to inject endorphins. Frank told me “takbuhin mo mabilis pababa para magising ka.” I told my crew to get my white tops with yellow dots. 156 My crew can’t find it. (okay, those yellow dots are abstract.) Just give me my orange shirt with check (Nike logo) – that one they got right! 157 I couldn’t remember a thing – it was downhill/uphill/downhill/I just keep on running. 158 Last two kilometers. Tere, do I look okay? I started to fold my compression shorts up as it looks weird. 159 Last one kilometer – charge my phone, take photo from my camera, Brian has my password! 160 Ugh, I almost miss the turn to the last 400 meters of 160 Kilometers….. It was the best SPRINT I have done my whole life. I outsprinted my mind who said I should give up. I outsprinted my body who said it’s tired. I outsprinted my heart which got broken every time my mind and body was winning. 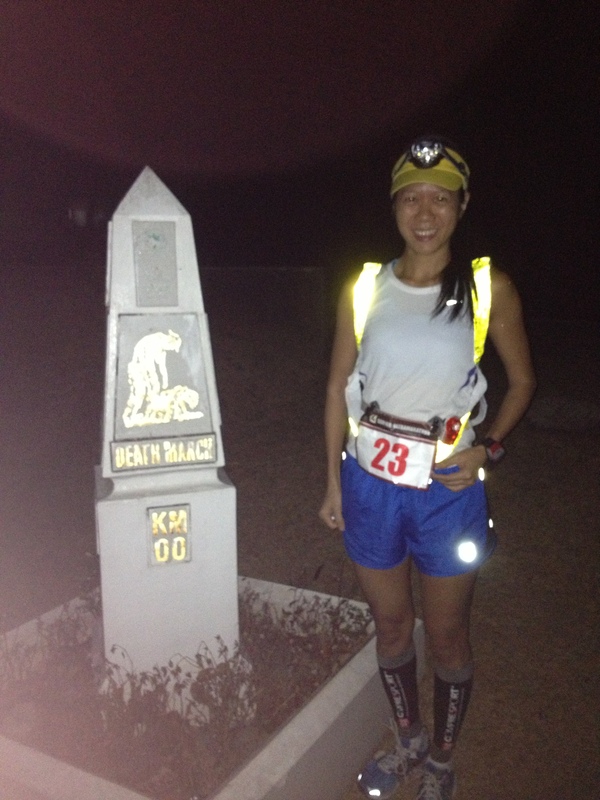 I sprinted to get the Bataan Death March 160K Buckle. I sprinted to start another race, this time as a better person. I have fought the good fight and will continue to fight for I know there’s a strength behind me that is BIGGER than everything else. To GOD be the GLORY! It was worth the FIGHT! We Run the Race to Win, All the Way to the End! Race that-(1) I’ll Never (2) I’ll think of (3) I might (4) I definitely-WILL DO AGAIN: RIP THE ROAD 5 TIMES! a looong read, but worth it. congrats!!!! Indeed, Len! Thanks for taking time to read. It’s an amazing article in support of all the web visitors; they will get advantage from it I am sure. Even if they want to buy a product or service eventually, they search for information first. real problem not for imaginary one.